Intelligent and deeply felt, Feast Days follows a young wife who relocates with her financier husband to São Paulo--a South American megacity that impresses and unsettles, conceals and erupts. Here in her new home, she reckons with the twenty-first century as she encounters crime, protests, refugees gentrification, and the collision of art and commerce, while confronting the crisis slowly building inside her own marriage. 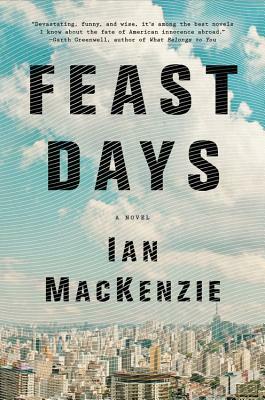 In stylish prose and with piercing wit, Ian MacKenzie tells the story of Emma, a young woman who has moved from New York to Brazil just as massive demonstrations against the government are breaking out across the country amid growing economic inequality. Emma has come to Brazil for her husband's career, with no job prospects of her own, a weak grasp of the language, and a deep ambivalence about having a child. Her early days in Sao Paulo are listless but privileged; she dines at high-end restaurants, tutors wealthy Brazilians in English, and observes the city she now calls home. But when Emma volunteers at a local church to assist refugees and grows more deeply connected to the people she meets in the course of her days, she finds herself unable to resist the tug of Sao Paulo's political and social unrest. As the country moves seemingly closer to a breaking point, so does Emma's marriage, as she and her husband can no longer ignore the silent, tectonic shifts beneath the surface of their relationship. Ian Mackenzie was born and raised in Massachusetts, graduated from Harvard, and since then has lived in New York City, Addis Ababa, Ethiopia, and Sao Paulo, Brazil. He currently lives in Washington, DC.